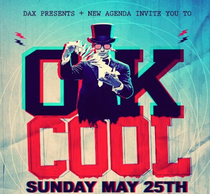 The Motor City venue, TV Lounge, is the location for the second annual Detroit installment of OK, COOL, an official Movement After Party hosted by Dax Presents from San Francisco and club residents New Agenda. Taking place on Sunday 25 May, Michigan native Seth Troxler tops the bill at what may be one of the weekend's most anticipated parties. The lineup also includes Troxler's Tuskegee label partners The Martinez Brothers and a rare and exclusive stateside appearance from fabric London's musical director Craig Richards. Three more Detroit exclusive acts will also perform - J Phlip from Dirtybird, Thugfucker from Life and Death and Eddie C from 7 Inches Of Love. Completing the bill are Rick Wade, Atnarko, Peter Blick and OK, COOL! residents Dax Lee and New Agenda. The ethos behind the OK, COOL! party series is to create an environment where fans, artists and industry can celebrate their love for dancing and music in a space with a combination of top production and talent - without any vibe destroyers like velvet ropes or bottle service! This event is coordinated through Dax Presents, run by Dax Lee, who is one of San Francisco's top promoters as well as a Burning Man sound camp leader, in tandem with New Agenda - a Detroit based crew run by TV Lounge residents Joshua Guerin, Eric Ricker, Ted Krisko and Dan Wagner. Ricker and Krisko are better know as Culprit Records duo, Ataxia. Sound will be provided by Audio Rescue team, and live video mixing will be courtesy of Koolik Visuals.